It was so much fun being back in St. Augustine this weekend! Especially for the wedding of two of my former neighbors! I literally walked right past my house with Letty Girl smiling through the fence to get to Angelica and Billy’s house for the festivities Sunday Morning. I knew from their Engagement shoot at Washington Oaks Garden State Park that we were all going to have a great time. They’re both so easy going and all their friends are same. The whole day was nothing but smiles and laughter (and a little bit of bug spray…backyards in Florida are notorious for mosquitos). Their grandparents may not have been able to be there in person but they still got to have a front row view of the ceremony and first dance. So special. They had a halfpipe in their backyard for Brayden to use and it doubled as a perfect dance floor! You guys I cannot thank you enough for letting me be a part of your day! Congratulations!! I use this quote often, and if I’m honest, I don’t know anything about the author, but it resonates so fiercely I continue to do so. It wouldn’t surprise anyone if I said I’m not cut out for the 9-5 lifestyle. Even when I’ve had other “regular” jobs they were never 9-5. Waiting tables and bartending often consisted of different shifts every week, with those changing 2-3 times mid week as others called out and I filled in. Working with teens more often than not involved late night phone calls (this was before texting was really a thing…I know, I’m aging), Friday night football games, Saturday shopping trips, week long camps and weekend retreats. Anything involving the church world was far more than Sunday mornings. It was taking a bag of groceries to families mid week when their food stamps ran out. It was late night texts talking people off the figurative ledge. It was frantic last minute schedule changes right before going on stage, a million emails, evening meetings and morning groups. Somewhere in the midst of it all I picked up photography and just fit it in where I could. As the story goes, one day I realized the thing I loved most shouldn’t be the thing I push to the back of the calendar wherever it fits, but should actually dictate my calendar. Full time photographer and entrepreneur has been quite the dream job. I make my own schedule, travel extensively, meet tons of new people and live wherever I want. Despite this perfect dream job, however, for a while there I was allowing the day-to-day of keeping up with the business side as well as family and house and garden and dog to overwhelm my deepest passion. And honestly, at the time I didn’t even realize it, I was so busy just doing stuff and keeping a full calendar that I didn’t give myself time to pause and reflect on what I wanted most. And what did I want most? As it turns out, adventure. There is certainly no need for everyone out there wanting more adventure to leave their jobs, their families, their city or their dogs, and my decision to do so didn’t even involve adventure…I realized afterward that adventure was a driver. But here are a few little things EVERYONE can do to insure a little more excitement and exploration enter your calendar. Take an uninterrupted hour or so to sit and decide if you even WANT more adventure in your life. Adventure has become such a buzz word lately, I’m finding that when people tell me they want more of it and I ask them what adventure would look like for them, they not only start off with the reasons why they could never do “something like that”, but they can’t even tell me what that “something” would even BE. So… WHAT DO YOU WANT? Do you even know? I have personally loved swimming with dolphins, hiking the Appalachian Trail and Hang Gliding the most. But with each of those, I DECIDED I wanted them first. If adventure is just this vague concept of something exciting, you’ll never do it. Figure out what said adventure INVOLVES. Do you have to travel? How far? How much does it cost? Do you have to take off work? Can you find a coupon? Do you know someone who might could hook you up with a friend’s discount or a place to stay while you travel to said location? If the cost seems insurmountable, what can you sell? Can you cut back on Starbucks and/or alcohol for 2 months to come up with an extra couple hundred? Is this something you do solo or does a friend join you? Maybe the whole family? Figure out what it involves and make a plan. Swimming with dolphins, for example, takes about 1 hour, costs about $250 with the photography package and a Florida resident discount, and, of course, requires that I be in Florida (or other similar beachy location). I found a time when I’d be in Florida anyway, found some friends I could stay with for one night, set aside the hour, saved the money and voila. Life long bucket list item: check. Follow through. Once you’ve figured out the details, make a plan, tell the world (or a close friend) you’re going to do it for accountability. THEN. DO. IT. What began the catalyst of my adventures was a New Year’s Resolution to have 12 new adventures in 2018. That meant I had to make a list of about 20 potential indoor and outdoor things I might like to do, and then once/month figure out how to make one of them happen. Then, rain or shine, with friends or solo, I just did it. And I haven’t looked back since. Fulfilling your wildest dreams doesn’t have to be so hard. With a little planning and a resolve to make it happen you can have hundreds of little adventures across your lifetime. There is no reason AT ALL to wait until you’re retired and frankly too old to physically accomplish what you want. We’re not even guaranteed tomorrow. What if you wait to have fun until you’re 65 and you don’t make it to 66? All those years working to finally live… for what? When telling people about my cross country trip this week I’ve noticed myself and others calling it the “adventure of a lifetime.” And while that is certainly true of my life up to this point, there is no reason why I shouldn’t be able to do a similar trip in a couple years. I don’t want to limit myself by thinking that my encounter with the dolphins will be the only one I experience in a lifetime. I hope to have many opportunities to have epic road trips, camp in the desert, snowboard in the rockies over and over again, and to someday again call Los Angeles one of my homes. I don’t know where I’ll be living next year, I barely know what the next two months hold other than weddings and my plan to jump back on the Appalachian Trail. I do know I want to walk forward with hands out and palms up ready to catch whatever joy or pain may come my way and I want to live a lifetime of adventure. It’s easy to think that epic adventures like this are impossible, but really we’re only limited by our imagination. And seriously, this trip could have been done for a fraction of that cost. I spared no expenses on food or the adventures I wanted to take. I could have been much more frugal, experienced fewer side adventures and/or prepared more meals in advance, but I wanted to experience the local flavors of each city, and I knew I’d make up the difference in shoots or dog walking. I realize not everyone can make $2500 on the road as a photographer…but you likely have other skills you can utilize BEFORE the trip to save up that money in advance. Selling stuff on Craigslist, seriously how many shoes or hats does one person need? Extra side hustle jobs like dog walking, Uber driving, babysitting (I walked for Rover while in LA and will continue in NC) or other freelance work, and networking with friends and family (and don’t forget extended friends of friends) for free places to stay while you travel. (My best tool for this was Facebook. In the search bar type “my friends who live in (insert city or sate).” There might only be one and there might be twelve, it’s worth checking, and it’s always a great excuse to catch up with old friends. Don’t be afraid to ask for help. Nine times out of ten people are MORE than happy to help you, they just don’t know how to unless you ask. If there’s one book I could recommend to help someone take a risk and plan an adventure, it would be 4 Hour Work Week from Tim Ferriss. I listened to it twice while driving. I was already doing basically everything he talks about, but he puts it to words in a way that helps people who have traditional 9-5 jobs figure out a way to live their dreams and not give up their income. Anyway if you need help brainstorming, don’t hesitate to ask! If you want to read more about the trip itself you can check out either this post about the various landscapes I encountered or this one about life on the road. St Francis Barracks Wedding | Rochelle and A.J. Saint Augustine was picture perfect this weekend as we strolled down the cobblestone capturing Rochelle and A.J.’s big day. The morning started with the St. Patrick’s Day Parade and a Celtic Festival, bringing thousands of people into the city! In the girls’ room we had a perfect view of everything and had fun seeing all the different costumes and characters walking by the window. While I was setting up a few photos of her details I managed to get my top knot deeply tangled into the room’s sprinkler system and all I could think of was that I was going to set it off completely soaking her beautiful dress! But Angela, her stylist, came to the rescue and got me loose! Since these two were already technically married the stress was at a minimum as they were there to have a good time and celebrate their already flourishing family. They chose the Saint Francis Barracks as their venue because they really wanted the beauty and feel of Saint Augustine without the beach vibes. The morning was going very smoothly considering all the people in town and then little Everly got hurt and poor Rochelle instantly had to switch into momma bear mode to make sure she was ok. I wasn’t sure if we were going to be able to pull off the first look (or even the wedding) as we were discussing the emergency room. But once she determined she was ok, she pulled it together and began walking toward the love of her life and as soon as she laid eyes on him I watched the stress fall from her face. With a great big smile she grabbed him and they were able to breathe and savor the moment. They allowed us to steal them away from their guests right as the sun was setting in order grab a few more glowy portraits, and I’m so glad they did! A horse carriage walked by right as we got back capping off the day with quintessential Saint Augustine flair. You guys thank you so much for trusting us with your day! We had the BEST time! It is decidedly sad that Mary Oliver passed this last week, but the event did present the inclination for many of her followers and those who had never heard her words before to dive into them. Her intentionality with seeing the world and life around her as well as her acceptance of death have inspired many to do the same. I have found myself returning to her words many times on this cross country excursion. And, as I’ve paid attention, and been quite astonished, it is now my duty to tell about it. I truly cannot get over the variety of mountains I have come across these past few weeks. Beginning of course in my hometown, with the low rolling and misty blues of the Blue Ridge on the east coast. I have photographed them often, but usually only to adjust my lighting before asking a couple or family to step in front of the lens and allow me to capture the mountains merely as a nice backdrop. When they are allowed to be front and center, the varying shades and subtle shifts of light become far more evident. Next the arid, multi-colored deserts of Arizona, surrounded by cylindrical spires that look built rather than evolved. I, of course, expected to see and experience the Grand Canyon, and it was, just as magical as everyone says. Vast as far, and farther, than the eye can see, and with edges that make you wish you were a bird so you could simply run and leap off the side! Perhaps the unexpected nature of stumbling across Sedona on several friends’ suggestions, I think, made it a bit more magical to me, however. The spontaneous schedule shift, extra driving to an unknown location and last second scheduled sunrise yoga session on the side of a cliff is simply something I won’t soon forget. I chose to hike alone first, early in the morning in order to get to the top of the mountain before the sunrise to capture a few shots and simply sit with the cacti as the light slowly and determinedly crept across the hills altering slightly everything it kissed. When I met up with the others for the yoga session, it was only 35 degrees as the wind whipped up the face of the cliff but the air was so crisp and the light so empowering you felt the temperature more as a welcomed tingling in your bones rather than something to shy away from. Growing up in the Appalachian Mountains I’m quite accustomed to the deep deciduous and ever-greens of winter, summer and spring followed by the outrageously vibrant oranges, reds and yellows of the fall. Something I’ve never experienced in nature before this trip, however, are the lush blue pastels painting Sierra Nevada alongside these lonely, dry, salty pink hills. An unexpected shift in the weather sent me driving north through the desert before crossing the rockies into San Francisco, and I could not be more grateful for the extended reroute. I spent hours just sitting and staring at these colors. There was something so tranquil about the undisturbed quiet reflection of the mountains. I wanted to stay all day but the pending snow storm was going to trap me if I didn’t move on. So move I did. By the time I got to the top of the mountain in Lake Tahoe, it was snowing and my little car was starting to give me questioning looks every time I stopped to capture a photo. The Rockies were not unlike the Blue Ridge in the color and selection of trees, they were simply immense. Snowcapped evergreens blanketed the mountains in every direction making me excited to come back in a few short weeks to snowboard at Big Bear. The cliffs of Big Sur surrounded by its icy turquoise surf was certainly the most unique bunch of mountains I came across. A place I’ve been dreaming about seeing for years, I was a little worried when signs mentioned several closed sections (due to landslides from the storm I’d avoided a couple days prior), but I was able to see everything I’d hoped to and more. The vineyard valleys that followed provided a startling spring green compared to the rest of the trip, but only emphasized the vast beauty across the country. Next, the fire scorched trails through Malibu, bursting not with pain, but new life from the ashes. A first glance at such scarring almost makes you want to look away, but further inspection shows the beauty breaking through because of the pain. Most forests do better after a fire, so while it’s hard to look at (and certainly not ideal for areas near homes and businesses), it’s all a part of a healthy process of growth. Finally as I flew into Seattle I was honored with the chance to see a blanketed Mount Rainier both from above and below the mist. It’s extraordinary to experience life from multiple perspectives. From above she looks alone and lonely, from below, however, you see the multitude of trees and the city to keep her company. Each set of mountains has had it’s own beauty and it’s own story. This world is ever changing and brimming with diversity, much like us. May we be brave enough to keep it that way, both in the forests and our cities. If you’d like to see the entirety of the images from the trip, feel free to leave a comment here or shoot me an email. (cynthia@cynthiaviola.com) I’ll be selling digital downloads and prints if you are so inclined. Thank you for supporting this grand adventure. I’ve had a lot of people tell me lately they are living vicariously through me, or that I am their spirit animal, or that I am living my best life, or that I have it made. Which, of course I love. I love to be in an inspirational role, and I do, in fact, love my life as well. It sometimes makes me sad though, because it’s usually said with a tinge of jealousy or regret of an unlived life. But if it’s my life you think you want, you can certainly make choices to follow in the same footsteps. Yes, even if you have kids, even if you have a full time job, even if you’re in school, even if you’re married. You’re never as stuck as you perceive yourself to be. We make decisions every single day that bring us one step closer or further away from the place we want to be. Unless you’re imprisoned, in a coma, caught in trafficking, paralyzed, or a child, you can typically make your own choices. Do so. I just wanted to share a few of the struggles for those considering a similar path to mine. While I love this life and wouldn’t choose anything different, it definitely comes with it’s own set of struggles that are not for the faint of heart. I am a very light packer. If I think I can get by with one pair of shoes or one dress, I will. I will do anything it takes to not have to check baggage at the airport and I usually have my camera AND laptop with me. This means stuffing clothes and shoes in all the spare pockets of my equipment bags and/or wrapping my camera in clothes so I can put it in my duffle. That said, when I know I won’t be going back to my parents house (where most of my stuff is currently stored) for TWO months, I can’t pack quite so light. It takes a LOT of planning and preparation. And then there’s the challenge of the seasons changing while you’re gone; this requires yet another bag of warmer clothes to add in as needed. My little car only holds so much, and the trunk is already packed with all my light stands and other camera equipment. Then when you get where you’re going and realize you forgot an important piece; you have to decide if you’re going to drive the extra 6 hours out of the way to go back to get it, find a way to borrow, go without, or buy new. I have two cameras with all the trimmings, an iMac, a Macbook, a photo printer, a paper printer, light stands, external hard drives, and backup gear which at any different time might all be on me, or might be scattered in multiple locations. This was never more of a problem than when I dropped my external hard drive in LA, lost all the data, and only had the back ups back in Charlotte. All because I forgot to press start on the online back up on the Charlotte computer before I left. I simply had to tell my clients they would have to wait an extra four days to receive their images, but when my workflow usually has weddings delivered in seven days, four is a big deal. I’m quite comfortable in my own skin, and as such, usually feel “at home” wherever my feet are planted, but there is definitely something to be said for having all your things in one location that you can return to in order to refresh, repack, organize your thoughts and feel safe. For me, that is currently spread across 4 cities. So while I feel partially at home in each of those locations, I’m never completely at ease. I am definitely looking forward to having something more structured when I return from my travels in the Spring. While I constantly surround myself with different clients and friends and family, there’s something about this lifestyle that feels very lonely. It's probably related to not having a home to return to, but big empty beds and tents, never ending roads and trails can be quite lonely. Especially for an extrovert. The path of least resistance does not interest me, however. Comfort can easily lead to complacency and that is not something I strive for. Each location grows me in a different way, and each moment spent alone in my head offers new insight. Figuring out who you are and what you want out of life, what you’re good at and what moves you to compassion, is the best thing you can do for yourself and others. If that requires a few lonely moments, I’ll take it without complaint. If you’re a routine person, this is not the life for you. In most things I love the chaos of an ever-changing environment. However, when it comes to my diet and my workouts, I do best with a routine. I’m at my best with 5-6 days a week in a Crossfit box and 6 protein packed smaller meals per day. This is rarely possible. Crossfit works on a class basis and my schedule often doesn’t aline with their options. Not to mention that it is meant to be paid for on a monthly or yearly basis, keeping the cost down. When you have to pay a $20-25 drop in fee PER class, it becomes simply too much. I’ve worked deals with 4 boxes in the 4 cities I’m primarily in, but it’s still more expensive than a long term rate. And meals are another challenge entirely. At each place I stay, I’m not sure how much access I’m going to have to a stove or refrigerator and my diet is almost entirely raw foods. (not to mention the super generous hosts who love to cook for me and offer snacks that just don’t align with my lifestyle). This however, leads me to my first of many blessings. One of my greatest strengths has always been adaptability, but it has never been stronger than it is now. Whether I’m sleeping on the floor, sharing space with kiddos or multiple animals, whether or not I have access to a microwave, shower, washer and dryer, or whether I have to drive an hour or more between my host and my photo shoots, I can handle just about anything that presents itself. I have been given 12 different keys to peoples’ homes to keep. I don’t anticipate needing to show up unexpectedly to anyone’s home (and definitely don’t remember whose is whose honestly), but the gesture is so kind. The idea that I’m always welcome, even if they’re not home gives me such a sense of love and adoration for the entire human race. Speaking of the human race, no matter how much the news or movies try to scare us into thinking all people are naturally bent toward selfishness and evil, I simply cannot believe it. Every single day I witness people opening doors for each other, letting others go first in line, giving up preferred seats on planes so families can sit together, buying coffee for the person in line behind them, picking up trash on the sidewalk that’s not their own, and offering their home to someone they barely know. All without regard to color, gender, religion or age. If you choose to look at the world through a lens of hate, you will see hate everywhere you look. But if you choose to look at the world with love, well, that’s exactly what you’ll find. I’ll make that choice every time. Some will say that is naive, but I believe the alternative is a life of anxiety. I’d rather walk boldly in love, knowing I might get hurt, than cower under the weight of ignorance and fear, never truly seeing all the world has to offer. The world is good my friends. People are good. So very good. If you enjoyed this post, you might also enjoy my thoughts on living in NC, or life on the Appalachian Trail. I decided at the beginning of 2018 I wanted to try to experience 12 new things. They didn’t need to be specific to any genre or meet any quotas for cost or time, they just had to be new to me. I wrote HERE about my midway point and I figured now would be a good time to follow up with the grand finale. Hiking my first 2 sections of the Appalachian Trail totaling 170 miles, 100 of them solo. All in addition to regular intervals of my favorite adventures like a new tattoos, concerts, camping, paddle boarding, cycling, go karts, new foods and traveling. All this started when I really owned my personality type (ENFP) and what it means for me. The “driver of my car” so-to-speak is exploration, and my co-pilot is authenticity. I am happiest when I’m on an adventure and when I’m making choices that feel good and true to who I am. Apparently, when following this plan, this is when an ENFP is best able to inspire others, which in turn, makes me feel good and true to who I am which makes me want to go on more adventures. It’s a beautiful circle. I feel immensely grateful for the never ending supply of new things to try. Adventures and exploration are definitely not for everyone. In fact, to get psychology technical on you, Extraverted Intuition (Exploration) isn’t even IN the cognitive stack of half the population. And only a quarter of people would have it as their driver or co-pilot. So I get it, a lot of people think I’m crazy or reckless or childish or unable to commit to anything, but for those of us who lead with this function and have ever had it stifled by school or family or religion or circumstance or inadvertent choice, you know that it’s the only thing that will ever make you feel alive. So to YOU I would recommend whole heartedly to set your own adventure goal this year and don’t settle for anything less. Life is too short to be stuck living someone else’s dream. What’s up for next year? I’ll be kicking the year off by driving across the country capturing memories for families across the way, hiking and camping in the Grand Canyon, experiencing Vegas and Mardi Gras and then who knows?!? I’d love to meet an elephant or dolphin; my all time bucket list item is the Aurora Borealis, I’d like to parasail or scuba dive. I’ll definitely hit the A.T. again but the sky is the limit! I’ll stick with #12newadventures because it’ll always be new and never boring. The world’s a roller coaster and I am not strapped in. At the beginning of the year, as I was moving to Florida, I posted a blog about things I'd learned living in North Carolina. One of those things was the beauty of the LGBTQ community. They'd taught me so much through the years and I'd wanted to give back. I vowed to give away a portrait session, or $500 off a booked wedding to one couple every month in 2018. I've posted several of them here already and some I'm sorry to say I was unable to post due to job constraints and some still having to live in fear of persecution. That said, I thought it would be fun to recap as best I could in a final post, to show the love that flows through us all equally. I'm so incredibly grateful for so many new friends. In January, I met up with Joshua and Daniel on a trip back to NC, they met me downtown in the brightest colors I've ever seen and we had an absolute blast. In February I attended a Rainbow Wedding Expo in St. Augustine where I was able to meet several new couples, fueling the following months, but I headed back to NC again in the cold and rain to capture Becca and Katie at their home with little Vivi. They made me breakfast and we talked for hours. I adore them. As a bonus, I got to spend some time with them again in the fall after they moved to their new home in Charlotte! Two different March couples fell through multiple times, so I planned to catch back up with them later in the year. April involved a couple I love and have known for years, we'll call them Steve and Dave; they came to St. Augustine to visit and stayed with us for a night, taking us to dinner and everything, it was so great to catch up. Unfortunately, Steve's job is yet unaware of his orientation and he would likely be let go. Ergo I won't be posting them here. Suffice it to say, that they are both incredible human beings who have done immense good in the world. May's shoot actually fell through as well, as Florida went through several torrential downpours, one actually resulting in massive hail damage and a neighbor's house catching fire from a lightening strike! So the May one will show up shortly as well. May did consist of Tiffany and Carlie's 5 year anniversary, that was not actually a part of the giveaway, but you should definitely go see all their cuteness anyway. June introduced me to Sam and Jess, who met up with me at the St. Augustine Pier, then afterwards took me to breakfast where we discussed relationships and faith and change. It was beautiful. In June I was also able to make up for one of the earlier reschedules in one of the most fun photo shoots of my life. I had shot Anse and Allie's proposal, engagement and wedding last year and for their anniversary they thought it would be fun to go camping and capture all the fun in that setting. I was SO excited! We met up at a Roan Mountain State Park campsite, and I just captured everything from building the fire to roasting s'mores to snuggling in a hammock. It was glorious. 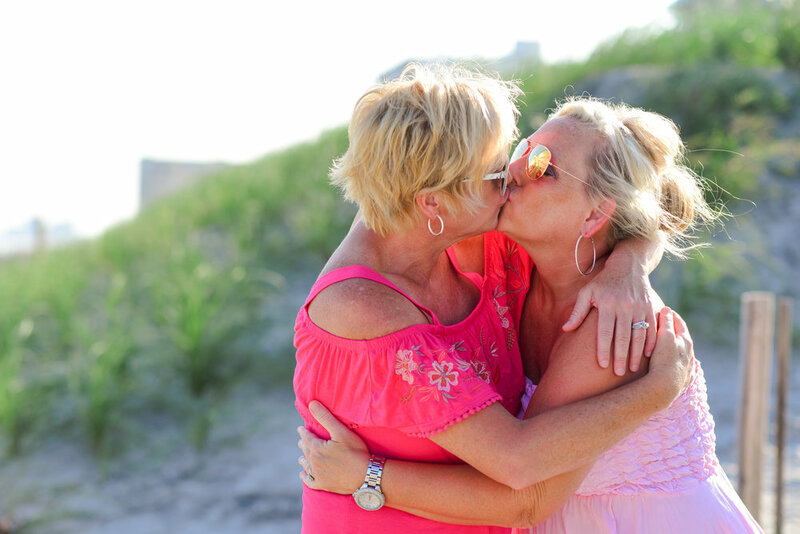 In July I drove up to Myrtle Beach, SC to capture the birthday party of an old friend and while there had the pleasure of capturing Sherry and Becky again! I'd shot their courthouse wedding three years ago and it was just a couple weeks shy of their anniversary! As and added bonus at the birthday weekend, I got to meet so many new friends and capture their beautiful relationships as well. 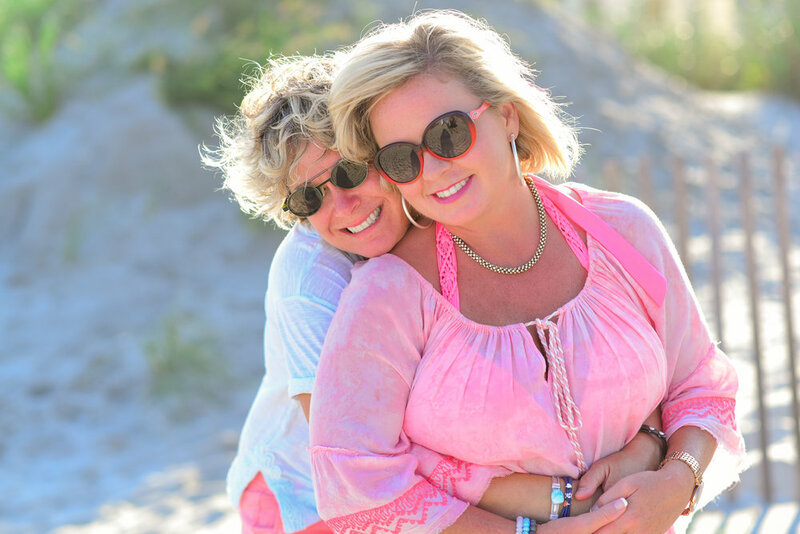 :) This is Lisa and Jeannie, Tomi and Angie, who were all about adventuring with me on the beach for some portraits. 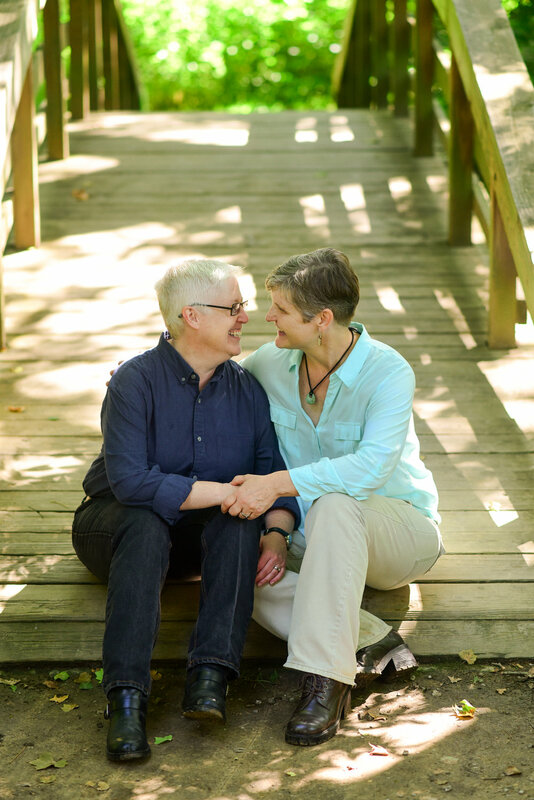 In August, while I was in Asheville to race the Spartan Super, I met up with Cindy and Marianne, who run the Rainbow Wedding Expo. 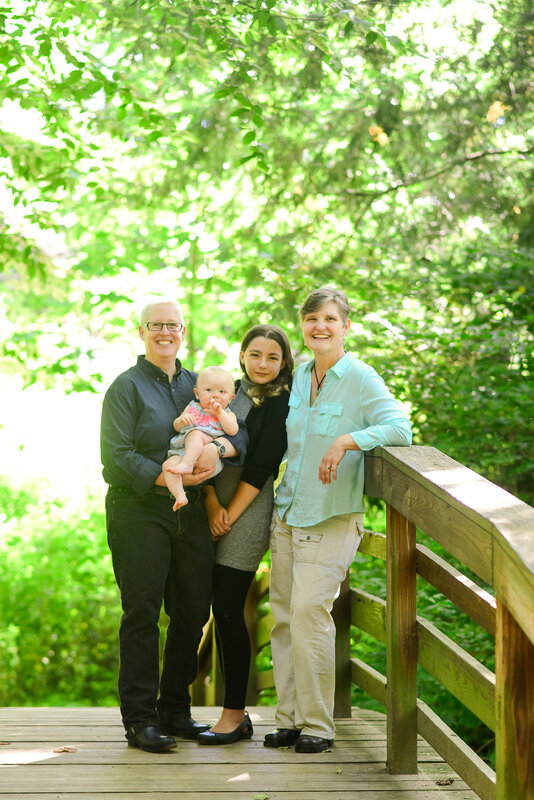 We were able to get some fun anniversary and family photos in the Botanical Gardens. Fun fact: they both planned a secret proposal to each other years earlier on the same day! They knew it was meant to be when they both showed up with a ring! They were on a bridge together and wanted to recreate the moment at the shoot. So fun! In September I was busy moving back to NC and Hiking the Appalachian Trail, but I more than made up for it in the fall. Additionally, while shooting Jessica and Jeff’s wedding this summer, I met and fell in love with the adorable relationship between Ryan and Henry. I loved they way they danced and generally interacted with each other and everyone around them. We caught up on Facebook afterward and I asked if they’d be interested in a shoot. Their 5 year anniversary was coming up so they were all for it. They even took me out for tacos and tequila after! So much fun! In November Sandra and Caitlin married in Saint Augustine and I was able to capture them afterwards at Washington Oaks Garden with their little Mari who stole my heart instantly. She loved them both so much and loved helping me find the best spots to pose them. When April, one of my former students contacted me to say she was interested in a shoot, I was of course, all about it, but when she said she needed to clarify and make sure it was ok that it was an engagement shoot…with another woman, I was simply heartbroken. That she had to clarify with me tells me I have a lot of work to do still, and that she had to clarify at all means we all have a lot of work to do. If people are not free to be themselves 100% of the time the rest of us suffer because of it. The world needs people who think outside the box as well as those comfortable inside it. We need every race, every gender, every background, every experience, every story. April and Reese were supposed to meet up with me in Asheville this weekend but it didn’t work out, so I’ll have to share their story next year, in the meantime, here’s a few other couples along the way at family gatherings and paid shoots and weddings who I can’t help but thrown into the mix, if for no other reason than to show just how many unique and beautiful people there are in the world and that love knows no bounds. I received a bit of push back from my own family and former clients who did not approve of this endeavor in the beginning. I lost a few relationships, and a few clients but what I've gained is immeasurable love and acceptance from a community I adore with my whole heart. I wouldn't change the decision for anything in the world. I hope that this small offering can help others take off blinders and see only love. I am grateful to everyone who has been patient with my own journey through the years and who has helped formed my current world view. May we all continue to grow in love and welcome people different from ourselves into our lives. Allowing our hearts to love bigger, deeper, stronger and wider will never shrink who we are or pull us into darkness. It will serve instead to propel us forward into the light where we all see our mutual flaws and idiosyncrasies and stand united on common ground. I must say, this weekend’s wedding was one for the books! When Kristin told me their idea to invite all their friends to their beautiful new home and then surprise them with a wedding, I was allllll about it. And it’s such a Kristin and Emerson thing to do to begin their marriage by thinking of what they could do to serve their friends and make the experience more fun and enjoyable for them. The first time I really had the chance to get to know them they were helping to set up and tear down Amber and Tony’s wedding. They worked tirelessly the entire time and asked for nothing in return. They are such incredible individuals, and together even more so. It feels like just yesterday we were wandering around Ravine Gardens State Park for their engagement session and they were wowing me with their incredible dance skills, and then they blew me away further still at their reception; I could have watched them for hours. They know each other so well they made it look effortless, as if they were the same person in two bodies. Simply beautiful. When they made the surprise announcement the whole backyard erupted into cheers. Everyone was so happy for them! They quickly ran inside to change their clothes while friends and family pulled out the chairs from hiding and set up the ceremony space. They were both in tears at the sight of each other and in the excitement of being surrounded by their favorite people at their beautiful new home. Everyone followed them to reception venue just down the street and the celebrating and dancing commenced. It was such a fun night! Thank you for inviting me to participate you guys! I had so much fun! When Jeff messaged me to say he was sad that I didn’t live in NC anymore because he’d just got engaged, I don’t know who was more excited when I got to tell him I was moving back! I’ve known him for nearly 10 years now and watched his incredible career grow and transform and him always with a huge smile on his face. We’ve had lots of fun head shot and event photoshoots together but they all pale in comparison to his big day! I was so excited to meet his fiance, Jeff, I was bouncing up and down in the hallway of the hotel waiting to begin their morning session. They had chosen to capture a fun pillow fight in their matching boxers in the room before starting the day and I cannot think of a better way to be introduced to someone’s love. They are SO fun together, constantly picking on each other and flirting, and since Jeff’s best man, Trey was in the room during the shenanigans, we were all rolling with laughter. The rain held off perfectly as we set up for their quaint outdoor ceremony at the Hamlet Depot and Museum while the trains rushed by surrounding them with a bit of history and beauty. Jeff sang during the ceremony with one of his friends and they even had a surprise performance from some of their friends of their favorite song from Rent, “Take me or leave me.” All the guests were thrilled and happy to sing along, they have so many talented friends surrounding them. I am so happy for you guys!! Thank you so much for inviting me to participate in your beautiful day!! If you enjoyed this post you might also enjoy this Tennessee Wedding or this Downtown Anniversary. I met these two lovelies when I captured Anse and Allie's wedding last year. Christy was in the wedding party and we became instant friends, she was just so helpful with every aspect of their day. Then we relived it all over again as Allie and Anse and dozens of their other friends jumped in to provide support both in the form of laugher and hugs as well as manual labor and borrowed details. From private conversations with the wedding party in the bridal suites to the grand toasts during the reception, their friends and family showered them with praises for their kindness and and adoration for their love. 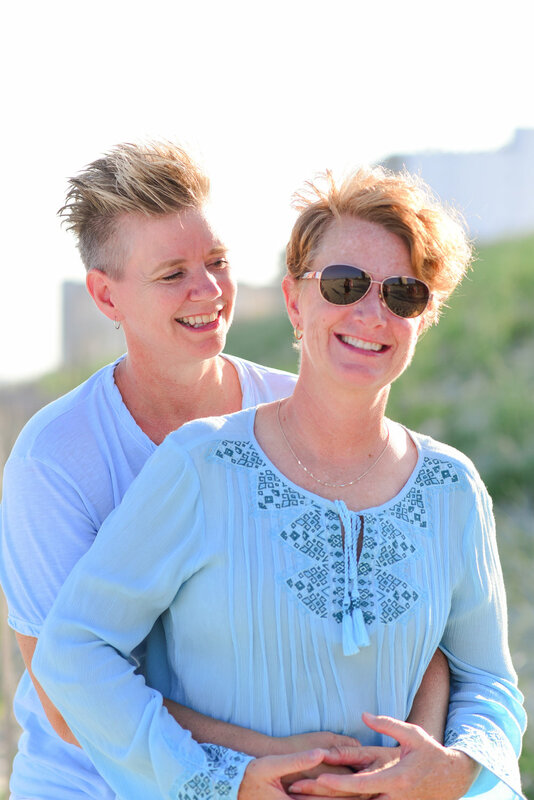 Christy and Tina said they ran in the same circles for a couple of years before they started dating, they got along great especially since both have more than one motorcycle each. For our pre-meet we met in a biker bar in Charlotte, which was so fun to see that side of their personality shine. They both have played many sports together like kickball and dodgeball and Christy has done a Spartan Race before, so of course we were practically besties by the end of our conversation. We all realized right off the bat also that none of us are fond of the most traditional aspects of weddings and I couldn't wait to see how they would make this day their own. They chose to do a first look, but wanted to make sure they didn’t see each other before that moment. This presented a slight challenge as their suites were right next door to each other, but everyone chipped in to watch out for them and I thought it was adorable that even though they couldn’t see each other, they simply spoke loudly through the doors so that they could still talk with each other, excitement growing with each passing conversation. When Christy couldn’t find the exact jewelry she was looking for, her friend Brandis made it for her. (In addition to the box that held it all) They have so many different talented friends, it was awesome seeing it all come together. Tina proposed inside a castle in Ireland while they were on a vacation and they will be going to Hawaii for the honeymoon; a lifetime of adventures has already begun. I’m so excited for you both! There’s something moving about capturing a family’s memories from the time their kids are in high school until they start walking down the aisle. I feel like I’ve been a part of Jessica’s family forever. It’s been nearly ten years since her aunt Colleen’s wedding, then with senior portraits for all three sisters, holiday parties and working with them on Help Portrait events, I’ve watched them all grow up and go off on their adventures and come back with tons of stories. This story, will be their best yet though. Tyler and Jessica have been inseparable for years and already traveled the world together, this fairy tale wedding was the perfect portrait of their journey together. Barclay Villa set the castle backdrop and in addition to her gorgeous wedding rings, Jessica wore a custom ring with her mom's first engagement diamond and blue topaz that her parents bought for her when they were on vacation 20 years ago. The 3 stones represent the three sisters and all of them plan to wear it on their wedding days. Between that, her mother’s veil lace wrapped around her bouquet and Tyler’s confirmation candles being used for the unity candle, the whole day was wrapped in history and the love of their families. I couldn’t wait to finally show some of Jessica’s bridal portraits from a few weeks ago! She is so stunning. Between grandpa’s in tuxedos and grandmas who can seriously boogie on the dance floor, I’m pretty sure they win the award for most adorable grandparents. This weekend was pure magic you guys! Thank you so much for including us in your fairy tale! If you enjoyed this post, you might also enjoy viewing, this Barclay Villa Wedding or this Raleigh Wedding. When I met Ann and Stephen I knew I’d found a couple that was meant to be together. Just the way they glance at each other and laugh at each other jokes and flirt is truly endearing. Then I really got to see their love shine as we explored the UNC campus for their Engagement session in February. You know you’re loved when people will come from all over the country to celebrate with you. Almost everyone there, including the bride and groom were from somewhere else: DC, New York, Michigan, Denver, Seattle, and it’s easy to see why, these two are very lovable from the moment you meet them, both individually and as a couple. Everyone just wants to see them succeed and I loved being a part of it. So lovable in fact, they rival Jim and Pam from “The Office.” You see, just before Ann put her dress on she noticed a tear in the fabric right on the very front of the dress, it wasn’t super noticeable, but still pretty devastating. She immediately sent Stephen a message telling him the news and, sensing how upset she was, said, “It’s just like Pam, you want me to cut my tie like Jim?” Cue ALLLLLL the tears from all of us! Oh my goodness he could not have said a more perfect thing. In their vows later she mentioned how he always knew how to say exactly the right thing at the right time to make her laugh. They are truly perfect for each other. Thank you so much for letting us participate in your most perfect day you guys!! If you liked these, you might also like this Oaks at Salem Wedding, or this one. There are not enough words to describe how much I adore these two. I’ve been following along with their adventures before they even knew they were in love and so many of us cheered them on as they found each other and found themselves in each other. I feel like Molly is my little sister in many ways, we’ve been hanging out since she was in middle school, same with Nick really. And then both of their parents have been mentors to me in various capacities for years, they’re truly a match made in heaven. I was overjoyed at the thought of capturing this epic moment for them. It seriously feels like yesterday I was capturing both of their senior portraits. We got mobbed by mosquitos as we walked through the JC Raulston Arboretum for their Engagement Portraits and I even stepped in an ant hill half way through the shoot but didn’t even care, these two are so easy to work with, we just laughed it off. I absolutely loved asking them questions about their future, because they’re dreamers like me and on that topic they could talk for hours. Hearing them plan out their future grandparent names and how cool they’d be made me giggle, but also made my heart explode. I can see that exact future for them as clear as day. You guys I could not be happier for you. This is just the beginning of your best adventure yet! You just never know where you’re going to find your next favorite couple. Evelyn sent me a message after having seen a comment I’d made on the Blind Barbour’s Instagram Page. We both share an affinity for the place and of course Joey and Michelle who own it. After a quick conversation we decided to meet up at The NC Museum of Art where she and Lawrence had shared their first date and I knew right away we’d be a perfect fit. Evelyn wasn’t a typical bride; she made it very clear, while this day was about both of them, of course, she wanted me to focus my attention on her groom. “I want him to feel loved and adored,” she said. Such a refreshing concept. While the day in general moved pretty quick, I know they’ll be talking about it for years to come. Every one of the guests couldn’t stop talking about just how happy they were for them. When Lawrence crooned “I can’t help falling in love with you,” to his new bride the whole room was in tears and we all loved them that much more. If you enjoyed this post, you might also like this Brewery Reception or this Raleigh Wedding. Father, Can a man change his stars? I do my best to live my life without expectations. I try to enter new relationships with an open mind, ready to learn anything a person might teach me. I try to take on new creative endeavors without thinking about the failures of the past; and I try to embark on new adventures with palms up, hands stretched out, ready to receive anything the universe might give me. That said, I’d be lying if I said I didn’t expect to dive deep into my psyche to pull out all the junk and clean house while off on my 100 mile Appalachian Trail adventure. Instead, I found myself thinking… left foot, right foot, don’t trip, easy with the knees, watch that spider web, what’s that sound, just 2 more miles, don’t forget to hydrate. Every time I consciously thought, “Alright focus. Time to deal with stuff.” I simply came up empty. All I could figure was that I just have no regrets. Period. Could I have made some better financial, business, lifestyle or relationships choices in the past? Sure. We all could. But I couldn’t think of anything I absolutely regretted or wanted to change about the path I’d chosen. And while unexpected, I guess that’s ok too. Not everyone has to have a mental or emotional breakdown in order gain a better understanding of the world. From then on I tried to focus instead on what and who was in front of me. I allowed myself to take in the crazy stories of the incredible hikers surrounding me. Allowed myself to learn from their mistakes as they spoke of their pasts and really listen to what they each might teach me. Two lady day-hikers on Mount Blood shared of their regrets in waiting so long to really get out in nature (they were in their 50s). How they’d allowed family life bury them in responsibility and forgotten to take care of themselves. Another long-section-hiker shared that he’d gone too long without being in nature and planned to make time once/month to just be out in the elements. 9-5 desk jobs have a way of creating this frequent dilemma. He told me to make sure once every mile or so to make sure I look up, look left and look right just to take it all in. It’s far too easy to do the safe thing of staring at your feet and your footing the entire trail and miss the beauty around you. A perfect life lesson I think. A cancer survivor, proudly displaying her lost hair shared that she finally had to go against her doctor’s orders because she knew within herself that the best medicine to detox from the chemo was not more bed rest inside the hospital, but fresh air from the mountains. She hiked all the way to the top of Rocky Mountain to simply breathe the air. We sat for a long time just enjoying the silence and scenery together. Instead of plowing down the trail as I had been doing (twice the speed and distance I had set out to do), I lingered longer on mountain tops, made myself get up in the middle of the night, exhausted, simply to marvel at the universe of stars. I took time to notice the hard work spiders put into their webs and tried to duck under them rather than sweep them away with my hand. I didn’t run off the family of chipmunks living the shelter but enjoyed watching them scurry about. I sat down in the middle of the trail to tell a turtle a secret and I simply stood in awe that I was blessed to share the trail for a moment with a momma bear, until she scampered off through the wildflowers. Life and people have so much to teach us if we’ll take the time to stop and listen. I know my career is unique in it’s ability to give me as much time as I had to really be on the trail. But everyone can take a day or an hour, turn off the noise, find a setting different than the norm and just be. One hour alone with the stars was the only inspiration I needed to push on when I was started to feel physically worn down. It was a reminder that we CAN change our stars if we only have the heart and will-power to do so. If you look around your life and don’t see what you want, do something about it; I promise no one else is going to do it for you. That might be as simple as a consistent yoga practice and it might mean the scary step of leaving the secure 9-5 for the lower-paid but far more fulfilling dream job. If you hate 8-10 hours of your day every single day, you are simply torturing yourself with a slow and painful death. How is that any way to live? And sometimes, it’s not the job or the relationships or the location that need to change, but our attitude toward them. Allowing yourself some time on the trail (or in the gym, or on the lake, or with that old friend or driving to that place) does wonders to make you appreciate the good already in your life. I haven’t looked at the stars in pitch-black night in years and I haven’t been able to see the “lines” that connect the stars maybe ever. But that night, with nothing standing in my way, no light, no moon, no distractions, only the quiet breeze and my destiny, I knew that the way I looked at my stars had changed and I was ready for this new life of constant change and adventure on every corner. When your daydreams mingle with your night dreams, the possibilities are simply endless. I also discovered quite a bit about peoples’ views of other people through this. So many people had endless questions about what I would do about bears, and what if someone attacked me, and what if I got sick, and what if someone attacked me, and what if I ran out of food, and what if someone attacked me… A lot of people were worried about the hurricane, but most were worried about other people. Then there were also the friends and strangers who cheered me on and wished me luck and told me to go for it and have fun and come back with stories…. In this, I noticed two trends. In the first example I found that many people who haven’t traveled extensively or who get their information about the world through the news tend to view the world and “those people” as a threat. Everyone has the capacity for evil and everyone will hurt you if given the right opportunity, (such as a girl alone in the woods). If however, like the second example, they’ve met enough real live people in their lifetime through their own travels and adventures, they’ve found quite the opposite to be true. That sure, there are a few bad eggs out there, but they will be found whether you’re on the trail or in the middle of the city or safe at home in your bed. The majority of people though, are good. Like really good. If you’ve been blessed with the opportunity to meet new people from different places around with world, with different views and different backgrounds, of different ages and races, you’ve likely found that most people are very kind and willing to help in anyway possible. I believe that to live in fear of others is to prevent yourself a life of joy through learning and a life of depth and wonder at the beauty of the human race. Enter Britney. The true heroine of my story. I spent countless hours on the trail and the most epic story to come out of it is when I finally actually arrived at my car. It was, in fact, dead. Like dead dead. Couldn’t even get the key to unlock it dead. Britney, a shuttler from Hike Hitchin’ rescued me over and over and over again. Not only tried to jump me (which didn’t work, because dead batteries don’t jump) but drove me into town 45 minutes away THREE times to buy a new battery and together we figured out how to install it in the car. (Not to mention her endless patience when we’d gotten almost back to the car before I realized I’d left the key ON THE COUNTER at the parts store). She is a saint. She asked for nothing in return, was just happy to help a stranded hiker. I now have a new friend for life because I put myself in a situation where I had to rely on the kindness of a stranger. I also gained a wealth of knowledge as she told me stories of her grandfather, dreams she and her girlfriend have for the future and current challenges she was overcoming literally that day. This. This is what life is all about. If that makes me brave, then so be it. I can’t think of a better way to have ended this trip. And endings are so important. No matter what you’re doing in life, whether having a conversation, going on a trip, or simply doing your job, if you can find a way to end well, anything that didn’t go so great in the middle will usually be forgotten. All the trudging through the rain and mice chewing through my backpack eating my food, poison oak and bruised knees…forgotten, all because of the kindness of a stranger. I drove away with a huge smile on my face, a feeling of triumph in my heart and of course had to pull over immediately because no less than the perfect rainbow graced me with its beauty. I’m grateful for a life filled with stories of people from all different backgrounds, and grateful for a future that will only bring more. May we all take a moment every day to see past bad moods, and poor decisions to see the good inside the person standing in front of us. Happy Trails. Every part of Jeff and Jessica's wedding weekend felt like a family reunion to me. Not just the fact that there were several other couples and families there I've had the privilege of shooting in the past, or the fact that I've shot at Highgrove before and worked with several of other other vendors before, but more for the fact that everyone was just so welcoming and friendly. From the bartenders and servers at their rehearsal dinner to their super helpful wedding party to everyone who pitched in to make sure the chairs got wiped down after the sudden downpour just before the ceremony started. These two have surrounded themselves with people who adore them and wish nothing more than to see them succeed in life and in their relationship. They even invited Jessica's family to participate in their engagement session which was so much fun! I love that they feel comfortable doing all their fun stuff together. You can view those images here, but it was great seeing everyone again and trying to recreate a few of the images throughout the day. I absolutely love working with Highgrove Estate! They truly go all out when it comes to client experience and making sure you have everything you need every step of the way. As I mentioned, the sky opened up just 30 minutes before the ceremony was to start but Jessica had her heart set on having the ceremony outside so Britnie worked her magic and held the guests inside just long enough to let the rain finish then they rushed in to wipe the chairs and saw to it that the show would go on as planned. We seriously had so much fun capturing portraits for these two. Jessica and I were doing everything we could to get her groom to blush as we spoke of the upcoming honeymoon. So cute. Near the end of the evening a T-Rex and a Hippo showed up, I'm still not sure where they came from but there were definitely the life of the party, dancing with the bride and grandma and tons of other guests! So much fun! You guys I cannot thank you enough for letting us be a part of your day! We had an absolute blast! It’s about time for an update on all things Florida and what the next few months are going to look like for me. I’ve loved every minute down here in the glorious sunshine but sometimes life and business just have other plans. Yep, I'm moving back to North Carolina. But I'll get to that part in just a second. It doesn't take long to glean a wealth of knowledge from a place if you enter it with your eyes, heart and hands wide open, ready to receive whatever may fall into your lap. Florida has been no different. It took no time at all to make friends and begin learning new rhythms and new ways of doing life. In case you missed it, you can also check out my Life Lessons from NC if you're so inclined. I'm not talking about the air conditioning. Florida people have the chillest vibe of anyone out there, and that crosses all generations. Retirees on sail boats, teens with long boards and surfer hair, neighbors who meander into your yard while you're working just to say hello - no shirt, no shoes, no problem. Seriously though, life moves a little slower down here, people aren't nearly as focused on arriving to a meeting on time as they are arriving with a smile on their face. I wasn't sure what to expect when we moved down here, but this was certainly a pleasant surprise. I feel like I fit right in instantly and am quite sad to say good bye so soon. #2: Tervis Cups and Yeti Coolers are Legit. When I lived in NC I'd receive these weird plastic cups with weird shirt-like patches inside them for Christmas and birthdays and I couldn't for the life of me figure out why someone would think I'd want that. Dude. They're sooooo handy on the beach. Just swallow your pride and get yourself one. Apparently I'm no longer afraid of water. Well, that's not true. I'm definitely less afraid though. I'd only had a half dozen experiences with the ocean from birth to 30 and three of those ended in me being rescued by a lifeguard because the undertow seriously has it in for me. I may be strong, but I'm not a great swimmer. I never did learn how to put my head under water without holding my nose. But clear water springs, bioluminescent plankton, 75 degree weather in February, pool floaties and friendly manatee opened me up to a world I never knew existed. I'm not 100% sure where I'll be living next, but I'm thinking water will need to be close by. I feel like I keep coming back to this lesson over and over because I'm such a people pleaser. It's so easy to fall into the trap of making everyone else comfortable with your decisions. (Hiding tattoos in front of grandparents, drinking certain beverages around some friends and other beverages around others, changing language in front of parents, listening to certain music while alone and other music around people, agreeing with one friend politically in one conversation only to agree with the opposite point with the next friend...yes I've been guilty of all these things through the years) Why do we do this? It is a never ending battle that will never be won. If one decision could please every single person on the entire planet, yet leave you feeling empty or fake, it would not be worth it. Knowing yourself is half the battle, but once you do, own it. Be you, no one else can. And that's ok. My thriving photography business had a hard time catching on in the Florida market and I keep finding myself spending more and more time traveling back up to the Carolinas in order to pay the bills. I’ll still be traveling back and forth but I’ll primarily stay in NC at least through this wedding season. As always, you can find my schedule and whereabouts pinned to the top of my Facebook Business page and I frequently post them to Instagram as well. Travel for all my current (and new!) NC clients is no longer an issue and I’m looking forward to seeing all my favorite NC peeps again! Also!! Bonus Lesson, I've found that I'm never more in my element than when I'm off on a new adventure. For an ENFP, the driver of my car is Exploration and Florida has some incredible opportunities to explore new and exciting things and the more I do, the more I want to. Next weekend I'll be taking up the Appalachian Trail again for about 15 days. I'll tell you all about it then, but I am so excited to challenge myself in a new way. Conquering a mountain is one thing, conquering yourself alone in the wilderness is quite another. I never want to be too comfortable for too long, growth requires change and challenge and I've never been more ready. I seriously work with the greatest families on the planet. It was such a joy to spend time with these guys last night and catch up on the past year. If you haven't been following along, you need to check out last year's shoot when they brought little Josie home from the hospital. Her story, and subsequently theirs, is inspiring. If you enjoyed this post, you might also enjoy this Downtown Raleigh session or this Extended Family Session.